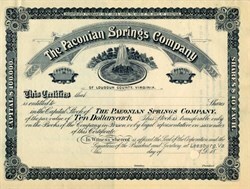 Beautiful RARE Specimen stock certificate from the Paeonian Springs Company printed in the 1889. This historic document was printed by the Leonhardt & Son Company and has an ornate border around it with a vignette of the springs. This document is over 114 years old. This is the first time we have seen this certificate for sale. Until the late nineteenth century, Paeonian Springs was an unnamed, sparsely populated piece of land in Loudoun County. By the late 1800s, Theodore Milton (1848-1906), co-owner of the Purcellville agricultural-implement and fertilizer firm of Milton, Bolyn & Company, had acquired property in the area and noticed the excellent taste of the water from the spring on his property. He recalled that the Capon Springs company in West Virginia had met with success by selling its spring waters, and he decided to try the same. Milton chartered the Paeonian Springs Company, named after a tribe of ancient Trojans, on 31 January 1889. The company, run by a board of directors, was authorized to sell stock. The company advertised the healing power of the spring water and expanded its charter on 15 February 1889 to allow it to purchase and develop the land around the company property as a resort. Theodore�s brother John Milton (1840-1918) surveyed the land in 1890 and plotted the Paeonian Springs Subdivision, the first subdivision of Loudoun county. The Washington & Ohio Railroad built a station at Paeonian Springs in 1892, and other businesses developed as the town began to grow. The Paeonian Springs Company itself prospered, selling 100 lots of the subdivision by 1898. Channing Meek (ca. 1856-1912), a speculator and head of a marble mine in Colorado, saw that the company was profitable and decided to invest in it. In July 1898 he indirectly bought all the unsold rights and shares of Paeonian Springs Company, which put him in control of the company. Meek was so occupied with his marble company, however, that he did little to continue developing the Paeonian Springs Company. When Meek passed away in a railroad accident, his brother-in-law took over the company and carried on the business. In 1906, the passage of the Pure Food and Drug Act forced the company to cease selling the water for its medicinal value, and by 1920 all sales of the water had ended. By 1931, most of the original town of Paeonian Springs was gone, including the spring itself, which had been weakened by years of drought and was finally pumped dry in 1926 by firemen attempting to save a burning mill. The first Paeonian Springs Day was held in June 1983 in order to create interest in preserving the historic town. On 13 March 2006 the Paeonian Springs Historic District was placed in the Virginia Landmarks Register, and on 17 March it was accepted to the National Register of Historic Places.